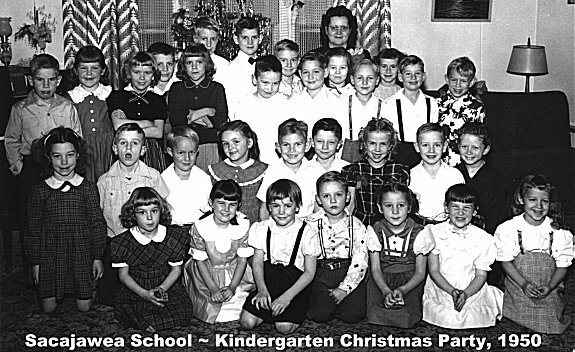 BACK ROW: 1.BillHudspeth, 2.RuthAnnBlanton, 3.MarilynSimmons, 4.boy_______, 5.KayBenjaman, 6.boy_______, 7.boy(darkBowTie)DeweyDeanWhite('60-Mrs.White'sSon), 8.boy_______, 9.boy_______, 10.BruceNewland, 11._________, 12.PaulKiefer(suspenders), 13.girl_______, 14.boy(suspenders)________, 15.boy________. MIDDLE ROW: 1.TonyaDay, 2.ShellyMcCoy, 3.DickSwanson, 4.SandraBuck(? ), 5.DavidMulvey, 6.AllenThompson, 7.CarolynNacke, 8.boy______, 9.boy______. FRONT ROW: 1.MaryPaseka, 2.AnnEngel, 3.PattyRice, 4.boy__________, 5.CarolNorthover, 6.NancyBott, 7. LindaDavis.